Chiles en nogada (stuffed chiles poblanos in walnut sauce), Pátzcuaro, Michoacán. Photo by Mexico Cooks!. For the entire month of September, Mexico celebrates its independence with parades, parties, and traditional food and drink in restaurants and at home. 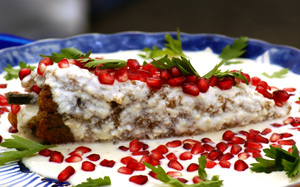 One of the most festive recipes connected with Mexico's Independence Day holiday is for chiles en nogada, a magnificent tribute to the seasonal availability of granadas (pomegranates) and nuez de Castilla (freshly harvested walnuts). From late August till early October, fresh pomegranates and walnuts make chiles en nogada possible. Spicy chiles poblano, stuffed with picadillo and topped with richly creamy walnut sauce and pomegranate seeds, flaunt the brilliant green, white and red of the Mexican flag. This festive dish is traditionally served on September 15 or 16 in honor of Mexico's Independence Day, though it is popular anytime in the late summer and early fall. During August and September in the highlands of Mexico, particularly on the streets bordering open-air markets in Mexico City and Puebla, village women can be seen sitting on blankets painstakingly peeling off the brown skin from each individual walnut. It is important to use the freshest walnuts possible, as they produce such a creamy, rich sauce that it is worth the effort demanded to peel them. Yes, although the recipe is not difficult, it is definitely time-consuming...but you and your guests will jump up and shout "VIVA!" when you have licked the platters clean. Warm the oil in a large, heavy skillet and sauté the onion and garlic over medium heat until they turn a pale gold. Stir in the shredded meat and cook for five minutes. Add the cinnamon, pepper, and cloves, then, stir in the raisins, the two tablespoons of chopped walnuts. Add the chopped pear, apple, and potato, and mix well. Add the tomatoes and salt to taste, and continue cooking over medium-high heat until most of the moisture has evaporated. Stir often so that the mixture doesn't stick. Let cool, cover, and set aside. The picadillo may be made a day or two in advance. Make a slit down the side of each chile, just long enough to remove the seeds and veins. Keep the stem end intact. Drain the chiles, cut side down, on paper towels until completely dry. Cover and set aside. The chiles may be prepared a day in advance. At least three hours in advance, put the walnuts in a small pan of boiling water. Remove from the heat and let them sit for five minutes. Drain the nuts and, when cool, rub off as much of the dark skin as possible. Chop into small pieces. Place the nuts, cream cheese, crema, and salt in a blender and purée thoroughly. Stir in the optional sugar, cinnamon, and sherry until thoroughly combined. Chill for several hours. Preheat the oven to 250ºF. When ready to serve, reheat the meat filling and stuff the chiles until they are plump and just barely closed. Put the filled chiles, covered, to warm slightly in the oven. After they are warmed to room temperature, place the stuffed chiles (cut side down) on a serving platter or on individual plates, cover with the chilled walnut sauce, and sprinkle with the parsley leaves and the pomegranate seeds. This dish may be served at room temperature, or it may be served chilled. It is rarely if ever served hot. Photos 2, 3, 4, and 5 courtesy of Jesús Guzmán Moya, M.D., of Puebla, Puebla, México. Enjoy more of Dr. Guzmán's lovely photos here. Gracias, amigo Chucho! And have a look here for more traditional Mexican recipes. We have a restaurant here in Merida - La Casa de Frida - they make a Chiles en Nogado using TVP (textured vegetable protein) - they make with meat also, but offer this option as well. It's what I get when we go there, although being lactose intolerant I have to get the sauce on the side and just use very little tastes of it. Wish the would make that using soymilk. There's a restaurant here in town that makes these for about a week per year, and the chef always makes a few vegetarian ones. Yum! Are walnuts more plentiful in the center of the country? Here in Mazatlán we have lots of pecans but the only place we see walnuts are in Mega on the gringo shelves! @Nancy...I am shocked to hear about the lack of walnuts in Mazatlán! 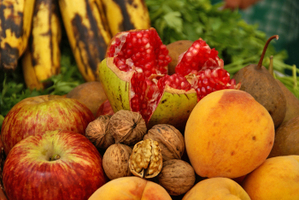 Walnuts are grown extensively in Mexico, primarily in the central highlands. 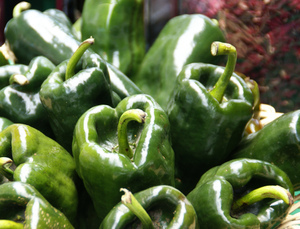 The crops are harvested starting in late July or early August, and the fame of the nogada (walnut sauce) for these chiles is based on the use of freshly harvested (NOT dried!) walnuts. The ones you see packaged in your Mega are dried and can be used for nogada, although they aren't really suitable. And oh my, neither are pecans! 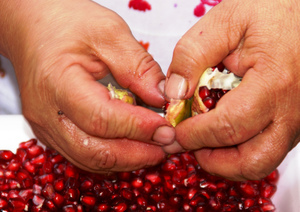 The other crop that is harvested at this time of year is pomegranates, the traditional garnish for chiles en nogada. Once you know these harvest times, you can see why the dish was created to celebrate Mexico's independence. Looks delicious. I can't believe I've never tried this dish... I certainly will now. And I have a new respect for walnuts too.